The ASICS FuzeX is a 9.5 oz/269 grams (US M9) 26mm (Heel), 18mm (Forefoot), 8mm drop, daily trainer. $110. Available now. 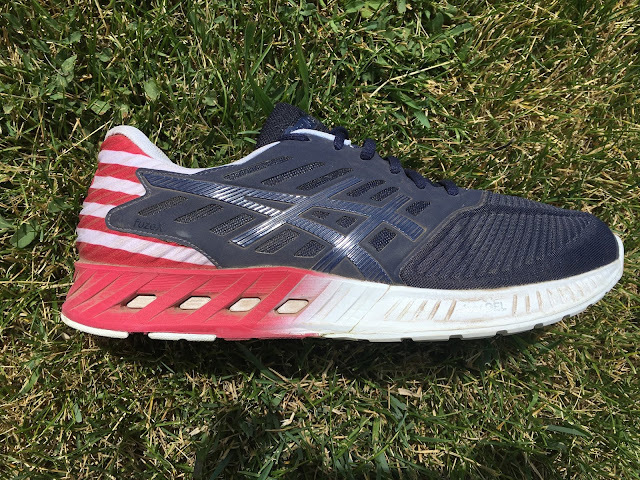 While the red white and blue combination is very cool, the FuzeX when first seen has had many say to me: it's a gym or lifestyle shoe. Yes, many may buy it for that purpose. The stability is outstanding from the combination of snug upper, firm outer midsole wrapping the heel, and full contact rubber. 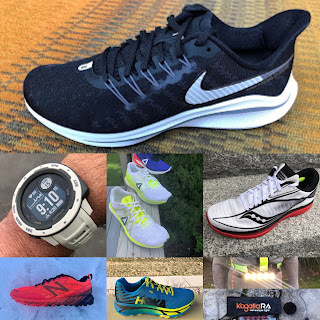 These attributes have also made this road shoe a very fine non technical trail shoe for me, rock solid steady if a bit thin on forefoot rock protection. The Fuze X fit me true to size, just. It is a narrow and snug fit due to the extensive overlays from heel to mid foot. At the toe the mesh is quite thick and dense yet still pliable with a soft woven toe bumper. As a result the FuzeX is not a particularly breathable shoe. There are no hot spots and length is fine. There is no question the foot is locked down in this shoe. When combined with the midsole construction stability foot hold to the platform is outstanding. Quite frankly the upper is overbuilt, and likely adds some weight. If your running is just on the roads and you have no particular pronation or ankle issues you might consider the FuzeX Lyte which has a an engineered mesh upper. Taken on the trail the upper really shines. The heel counter is high, long, and very stiff, another feature contributing to the overall stability and foot hold to the platform. No issues were noted, no rubbing or discomfort there. The tongue is decently padded with a bootie construction further enhancing the overall upper stability. The substantial upper wraps the foot well. This is a lace once and done shoe. The effect is a relatively soft forefoot ride yet a stable one due to the outsole horse shoe shaped outsole picking up the stabilizing upfront. The heel is relatively firm and very stable due to the cradle of SOLYTE but by no means harsh in large part due to cushioning of the Fuze GEL soft core. The theme of softer center firmer outer perimeter carries to the outsole. The outsole is AHAR firm rubber the white and darker red at the heel, and also the white horseshoe wrapping the forefoot. The center lighterred and blue areas are a softer blown rubber. While pressing in the center forefoot blue area, Fuze is among the softest there of any outsole/midsole combinations I have seen this year, yet on the run the feeling is stable comfortable cushioning and no mush or instability. I worry a bit about the durability of the blue outsole material but no wear has been noticed to date. The deep grooves do have a tendency to collect pebbles when on trail but clear as the shoe flexes. The FuzeX has a stable ride. The heel is firmer than the forefoot but not as noticeably so as in Saucony Zealot ISO 2 (review here). 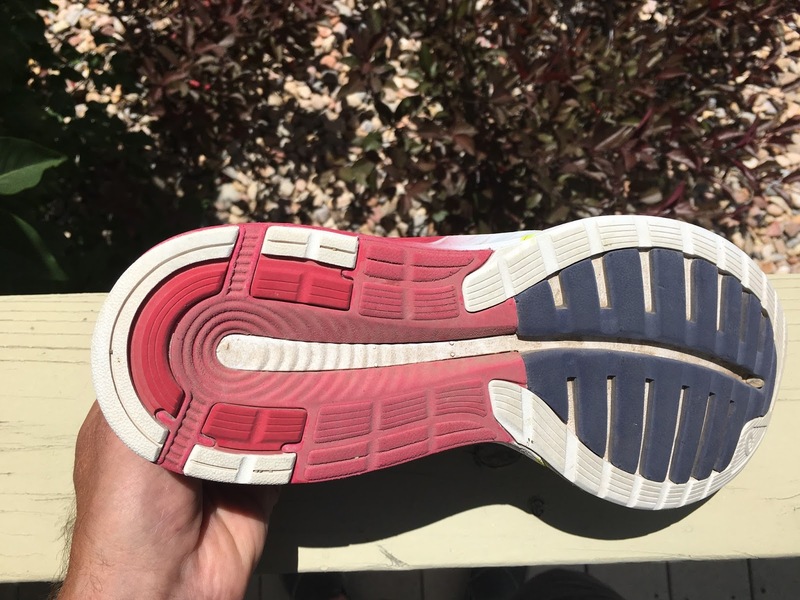 The FuzeGEL material does its job as there is a distinct rebound but not a bouncy one as with adidas Boost or Skechers 5GEN foam. The ride sits somewhere between responsive and very stable cushioned, a good combination for a basic daily trainer. I think the firmer midsole ring around the rear of the shoe is a bit stiffer than it should be and the heel counter to massive and high ,making the shoe overly torsionally rigid for a road shoe. The ride is not plodding that's for sure but is a bit overly restricted especially when the snug supportive upper is taken into account. The FuzeX is a very good choice for a steady as she goes daily trainer with very decent rebound properties. At 9.5 oz it is by no means heavy but the upper is overbuilt for my road purposes. Cool red white and blue color way aside, its diagonal lined upper and midsole motif is not my favorite, a bit modern and busy. The snug upper may be an issue for those with wide feet although up front while snug, toe splay into the soft FuzeGEL feels good. FuzeX may be helpful for runners with weak ankles, as a dual duty run and gym shoe, and for those moving away from pronation control. I have found it also particularly good for runs where road and non technical trails are mixed due to its stability and trail worthy upper. We are glad that ASICS which has struggled with matching competitors lighter weight trainers and midsole materials innovations is back in the game with the FuzeX and just released DynaFlyte. -0.1 upper could be lightened up and made a little less snug. -0.5 while the soft blue forefoot rubber is comfortable, more responsive firmer rubber would be good. 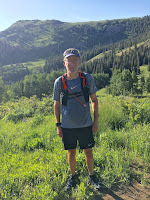 Sam is the Founder and Editor of Road Trail Run. He got the run and gear bug early, testing some of the earliest Nike shoes in the 70's, in high school, when Nike had their original R&D in his hometown. Early 100 mile weeks and lots of trail running led him to a HS 2:37 marathon, (2:28 PR), 2 junior division victories and 2 top ten all time junior times at Mt Washington, and the 1976 Division 1 NCAA XC championships with his Dartmouth team mates. Fluency in French took him for work to Switzerland where he ran many classic mountain races (30 in one year including ski marathons) and met his wife Dominique, also a marathoner. Raising a family and with entrepreneurial and consulting ventures in materials science, in-store media, early internet social media, and electronic medical records his competitive running took a long hiatus. He got back at it 10 years ago when work took him to the mountains of Park City, UT. His annual goal is to break 1:40 in the half, and if he can...,qualify for Boston. 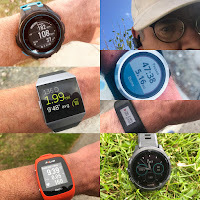 A tech, shoe, and gear geek he is also the wearable tech columnist for Competitor Magazine. Over 35 in depth Road and Trail Shoes reviews in 2016! The ASICS FuzeX is available from Running Warehouse in many different colors. Use Coupon Code RTR10 for 10% off!